← Who Is Gloria Steinem and What Is Her Role in Feminism? What Were the LA Riots? In the late 1980’s, amid the rise of unemployment rates in Los Angeles, communities began to suffer and show signs of unrest in the form of gang violence, drug abuse, and the ever-growing threat of a crime wave that would sweep across the various neighborhoods of the city. This sort of unrest, mainly believed by minority cultures within the neighborhoods of LA, brought about efforts by the Los Angeles Police Department to contain crime with less than savory or excessive practices for which many thought police were not being held properly accountable. Three years later, in March of 1991, the infamous beating of motorist Rodney King was recorded and sent to KTLA for broadcasting, resulting in charges brought upon four officers for their show of excessive force. Only a couple of weeks later, Korean grocer Soon Ja Du shot and killed Latasha Harlins, a 15-year old, in a suspected shoplifting incident. The African American community had suffered two significant sleights, for which they would receive no justice. Despite the efforts of Los Angeles mayor Tom Bradley in forming the Christopher Commission – in an effort to investigate operations within the LAPD, an effort that would only come to recommend a new system of accountability – Chief Gates would stand by his methods. November of 1991 saw Du sentenced to community service with suspended jail time, and the final straw came in April of 1992, following the acquittal of all charges for the four officers involved in the Rodney King case. The crowd drawn to the courthouse in an effort to protest the verdict came within only a couple of hours, growing violent just as quickly. Local police were forced to withdraw due to the escalating violence on part of the citizens. South and Central Los Angeles went into an uproar, rioting had consumed stores, neighborhoods and even a police headquarters in flames before the end of the night. Governor Pete Wilson had ordered a state of emergency only hours after the verdict had been passed, and the National Guard was called to suppress the rioting. Within a couple of days, the violence had suspended many governmental services within the city and caught national attention, requiring President George H.W. Bush to deploy Federal officers by the thousands to Los Angeles. Backed by nearly 10,000 armed individuals, the riots were quickly calmed, and Los Angeles had gone to work in repairing the damage it had suffered. But the cost was high. After all was said and done, the near-week-long rioting had tolled about 12,000 individual arrests, 2,000 injuries and over 60 deaths. Nearly $1 billion in damages had been sustained with 3,000 buildings destroyed. Attention had been called for deeper investigation of the LAPD and attempts to implement new policy were met with greater success as a result of what was later dubbed the Los Angeles Riots. Supporters of Rodney King and critics of the police’s display would receive some measure of justice as well when Koon and Powell, two of the officers involved, were sentenced to 30 months of jail time each for violating his civil rights. King was also ultimately awarded nearly $4 million in a suit against the city. In later years, many believed the LAPD to be performing better under oversight by the Department of Justice, with other scandals since uncovered and corrected. The department had been overhauled to a significant degree that oversight was completely lifted by 2013. 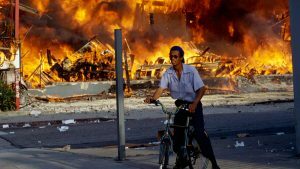 Comments Off on What Were the LA Riots?